In this method, the file is shown in an adjustable pop-up window. The most common method of previewing a file is by using the Preview pane. 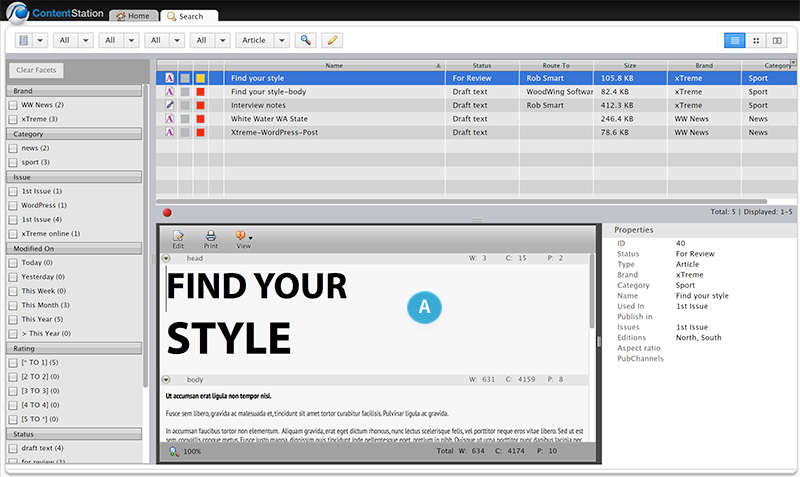 Figure: Previewing an article in the Preview pane (A) of the Dossier Content mode of a Dossier. Figure: Previewing an article in the Preview pane (A) of the Search mode. When the article is placed on a layout, you can view the way the article looks within the design of the layout. Figure: Previewing an article that is placed on a layout. 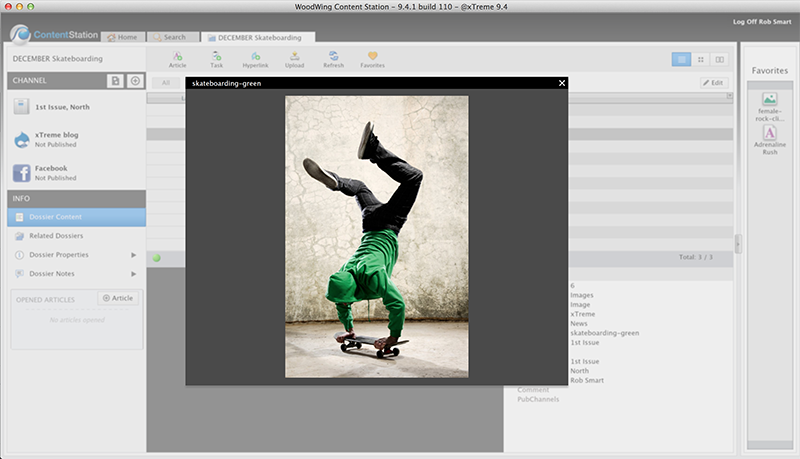 Working with the preview is done by using the tools in the toolbar. Note: In Content Station versions 9.0 – 9.4, the toolbar appears when hovering the mouse pointer anywhere over the layout preview. Choose the layout and Edition on which the article is placed (possible when the article has been placed on more than one layout). The preview is automatically updated. Note: In Content Station 9.0 – 9.4, the layout and Edition need to be chosen from separate lists and after making a choice the Create Preview button needs to be clicked to generate a new layout preview. Refresh the preview to get the latest version of the layout and its placed components. All changes that are made by you are visible immediately. It is not necessary to first save the articles. 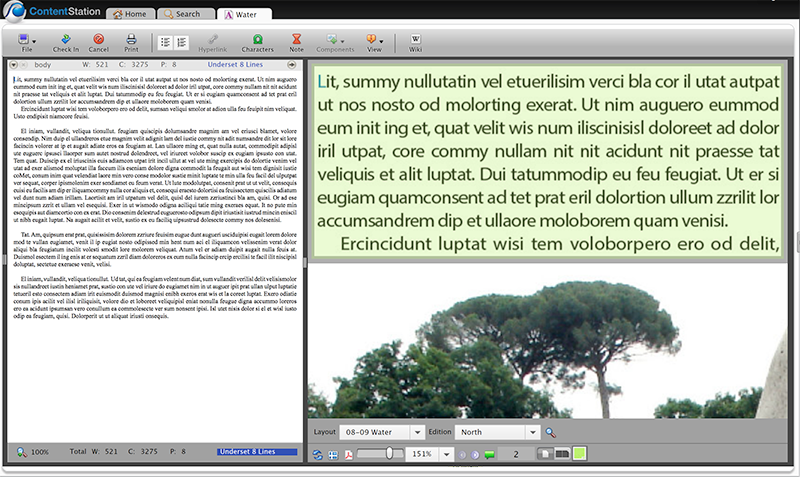 Example: Two articles are placed on a layout. You open both articles and make changes to the text. When refreshing the preview of the layout, you will see the changes of both articles. Changes made by other users are only visible once a version of the article has been saved. 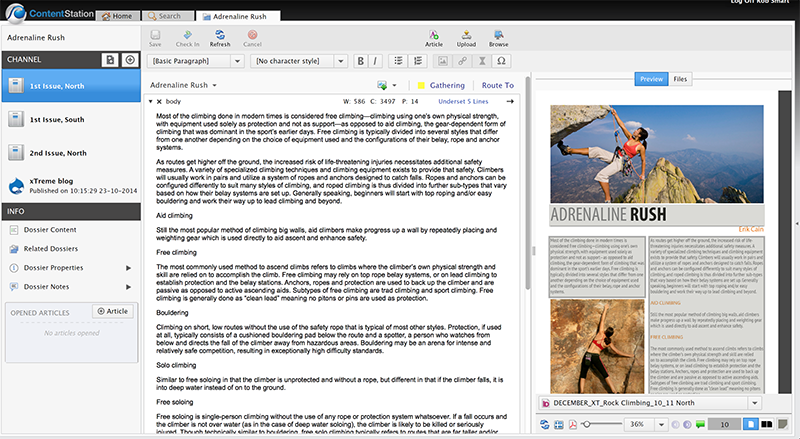 Example: Two articles are placed on a layout. You open one article and make changes to the text. Another user does the same for the other article. When you refresh the preview of the layout, you will only see the changes of the article that you are editing. The changes made by the other user are only visible to you when that user saves a version of the other article. 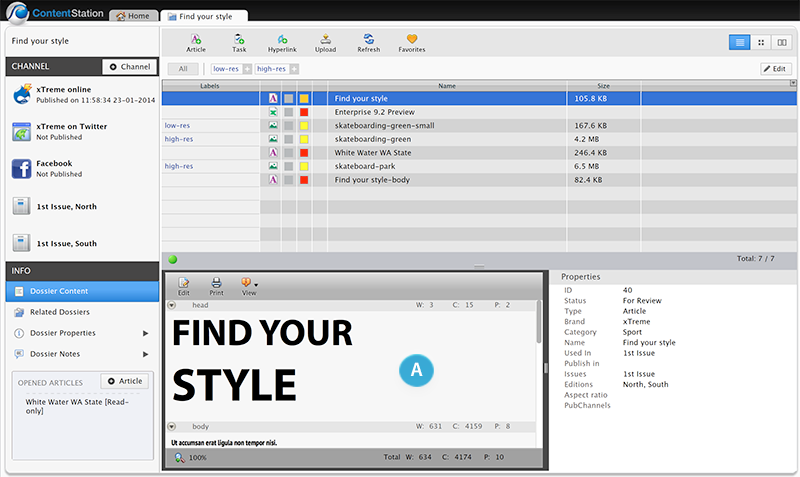 Get Copyfit information. An article component can have a maximum number of characters or lines defined, known as 'copyfit'. Clicking the Copyfit button will show you if you are below that maximum (known as 'underset') or above that maximum (known as 'overset'). Download the layout preview in PDF format. Zoom in or out of the layout preview. The zoom range is between 20% and 200%. Navigate to another page (when available) by using the Next button or Previous button, or by choosing a page from the Page Preview button . Choose between single page view or spread view (only available when the article is placed on both pages of the spread). Highlight the article components by choosing a color from the color picker or remove the highlighting by choosing 'transparent' (requires Content Station 9.5 or higher). In the Editing pane, click the Focus Preview button in the toolbar of the article component. The article component is positioned in the top left corner of the preview pane and its width is matched to the current width of the Preview pane. Figure: The Focus Preview button. Double-click a visible article component. The article component is positioned to the top left corner of the preview pane and its width is matched to the current width of the Preview pane. In the Editing pane, the cursor is placed at the beginning of the text in the article component. Figure: An article focused in the Layout Preview pane after double-clicking it. Note: This feature only works for article components which are part of the opened article; double-clicking any other articles on the layout will not automatically zoom in on them. Tip: Double-clicking the article component once more zooms the page out to make it fit within the current size of the Layout Preview pane. Why don't all article components appear in the Layout Preview? When you open an article in Content Station and a new article component is added, it will initially not appear in the Layout Preview. Only when the added article component has been placed on the layout (using InDesign) and the layout has been saved to Enterprise will it appear in the Layout Preview in Content Station.